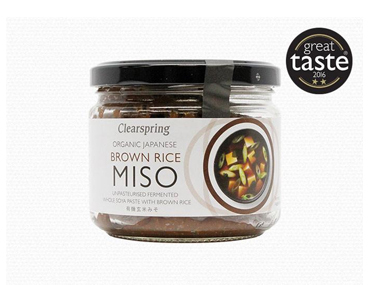 Buy Clearspring Organic Japanese Brown Rice Miso Paste - 300g jar in the UK from our online shop or directly from our independent Scottish store. Miso is an authentic vegan fermented food which has been produced in Japan since the 8th century, over 1,000 tons being consumed there daily in many dishes and soups. This robust miso, Genmai Miso in Japanese, has been developed for maximum nutrition. Since it is made using whole soya beans and brown rice, it has a very wholefood nutritional profile. Depending on the region and climate where the miso is made, the skill and experience of the brewmaster judges when the miso has reached its optimum maturity. This can vary from 6 months during a hot summer period in certain prefecture to 18 months in colder regions. Enjoy this hearty miso year-round in sauces, spreads, baked dishes, soups and stews. This brown rice miso paste is unpasteurized. As official Clearspring stockist, we sell genuine Miso & Miso Products directly from our shop in Scotland and online throughout the UK. The Clearspring goal is to get organic food back on the dining table, by developing the demand for organic foods and encouraging the cultivation of organic crops by farmers today. View more products from Clearspring. Where can you buy real Brown Rice Miso Jar safely online? If you are wondering where you can buy Clearspring Organic Japanese Brown Rice Miso Paste - 300g jar safely online in the UK, then shop with us. We are an actual health foods shop; with real people selling real foods and products. Our award-winning independent shop is located in Stirling, Scotland since 1976. You can buy our Organic food and other genuine Miso & Miso Products in store or safely place an order with us online or over the phone. Brown Rice Miso Jar - Clearspring Organic Japanese Brown Rice Miso Paste - 300g jar in Miso & Miso Products and Miscelanious Ingredients.